Dr. John Kim always knew that he wanted to take care of people and wanted his future career to be in health care. While considering the direction his career should take, Dr. Kim consulted his cousin, who was enrolled in Chiropractic College at the time. “My cousin was my inspiration. And when I looked further into chiropractic as a career option, it became very apparent that it was the right fit for me. Dr. Kim was born and raised in Toronto and attended high school at St. Michael’s College School. Later, he attended McMaster University and received a Bachelor of Kinesiology, the scientific study of human movement. After university, Dr. Kim decided to enroll at Palmer College of Chiropractic, in Davenport, Iowa, in the United States. After graduating in 2002, Dr. Kim remained in the United States working alongside highly respected Chiropractors in the Chicago area. He attended numerous seminars and continuing education courses with the purpose of gaining knowledge and experience that would allow him to provide the highest quality of Chiropractic care. Shortly thereafter, Dr. Kim established Kim Family Chiropractic in Milton, Ontario. Dr. Kim is a dedicated husband and father. 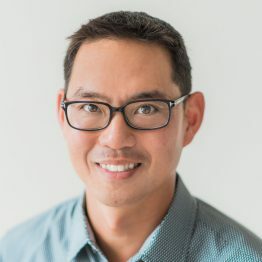 As the father of two active boys, Dr. Kim finds time to coach some of their sports teams, attend their school activities and be ever present in all aspects of their lives. He personally maintains his health through regular exercise. He enjoys swimming, biking, running and other athletics. He eats a balanced diet and is regularly adjusted to maintain his spinal health. Dr. Kim is very active in his community and is a big sponsor for many of the sports teams and community events and organizations. Dr. Kim is also a member of the International Chiropractic Pediatric Association, Chiropractic Awareness Council, and Holy Rosary Knights of Columbus.